A Gauze (UK) or Scrim (USA) is a coarsely woven cloth which can appear transparent or solid depending on how it’s lit. The words ‘Scrim’ and ‘Gauze’ are used interchangeably. To make the gauze appear solid, you should light across the fabric, but not cover any objects behind the gauze with light. Conversely, to make the gauze appear transparent, no light should fall on it. A shadow on scrim from behind can look great. The following image is from a youth production of The Wizard of Oz a the Northcott Theatre in Exeter, UK. Lighting design by Jon Primrose. The scrim used is a Sharkstooth Gauze. 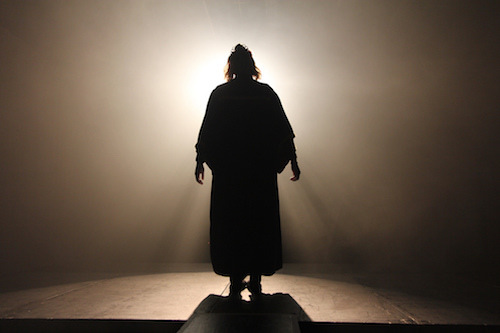 The witch actor is casting her shadow on the scrim from a floor light behind her, but the image of the actor is also visible through the scrim. 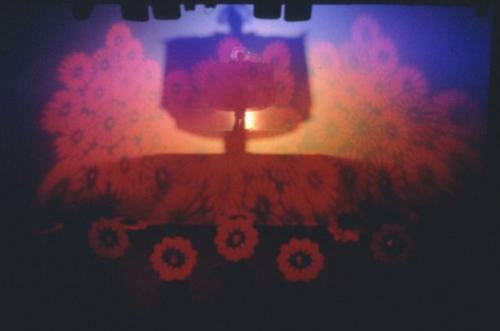 The red poppies are projected onto the front of the gauze using a pair of profile lanterns using gobos. 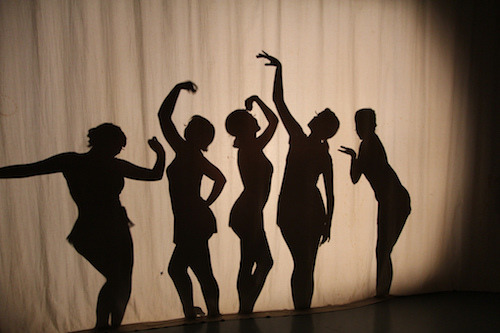 A solid cloth will produce a definite shadow, but there won’t be a silhouette effect – the photo below shows a group of dancers behind a white calico curtain with a single floor light casting their shadow on the cloth. Dancers behind a cloth, backlit from the floor by a pebble-convex lantern. University of Exeter Drama Department 2014. The photo below shows an actor backlit by a single lantern with covering of haze / smoke to make the air appear thicker and to enhance the silhouette effect. Instrument at head height backlighting actor creating a silhouette effect with haze in the air. University of Exeter Drama Department 2014.